Ahead of this weekends action in the season opener we caught up with Linebacker and Kicking Specialist George Evans to discuss a variety of topics. Hi George, thank you for letting me interview you. Just to get things started could you give an overview of your football life to date, how you got in to playing the game and some personal football high’s and low’s? Yeah of course, it goes back to when I joined the University of Chichester and my house mate used to play for London Blitz and is a mad Redskins fan. He kinda lead me down to the rookie day I had never really watched or even thought about playing before, and after one day I was hooked. Started playing linebacker and kicker for the uni as well as watching every week. Ended up being a JETS fan which is good. And after Uni I became the DC for the Chichester Spitfires as well as started playing for Portsmouth dreadnoughts. Some highs for me so far after the last 6 years has been coaching the uni team and my first pick six two years ago for the dreadnoughts. Some lows, luckily I haven’t had too many but obviously loosing the final last year and I missed my first ever field goal for Chichester in our first ever game which would have won us the game. What would you say are the main differences in Uni and “Adult” ball? I would say the speed is the biggest one, moving from uni ball to men’s everything becomes quicker. So much less time to think and react but that’s all part of the development. Size is a big difference as well, I went from being one of the tallest at the uni team to being small at men’s ball. These are the two biggest differences with uni and men’s ball. You play Weakside Line-backer, can you please describe this position and the attributes needed to play it? Weak side linebacker is every defensive players dream, you blitz 95% of the time and your only job is to get to the quarterback. Unless your talking to Head coach LHR then my main responsibility is outside contain. Because the outside backer at dreads plays more of a stand up end role you have to be quick (either with your hands or feet) because the guys you are coming up against are all o linemen much bigger than yourself. But also you have to have good reaction times, playing so close to the action and where the plays start to develop you need to be able to react and get to the ball carrier as fast as you can, or at least Chanel them in to a populated area. As well as defence you play special teams as a kicker and punter, could you please tell me about these roles in American football and the pressures of performing this position? Kicker and punter are probably my favourite positions on the pitch. I love special teams and the impact it can have on a game. As a punter your job is to take the snap and kick the ball as far and high as you can, giving your team more time to get down field and make a tackle/ jump on a fumble or loose ball. You don’t have a lot of time in this position to get the ball away and the pressure is huge because if you get caught or blocked the other team are going to have great position on the field and then even worse I have to stay on the field and try and stop them. Kicker is split in to kick off and field goals. Both again fantastic fun, kick off is as it sounds, kicking the ball from the tee at the start of a the game/half or once you have scored. Same principles as punt get the ball down field with loads of time for your guys to get down to make a play or kick it out the back of the end zone for a touch back. Once you’ve kicked it normally you just pile down field to try and make a tackle but now we are getting better and our opponents are getting better I play more of a safety net and sit back and wait for worse case of return. Field goal is probably the the position you can get the most glory from, nothing better than converting three points or a PAT for your team (not always converted I must say) but with fakes to run out of it you can have a lot of fun. Plus playing next to Toby Doyle (Longsnapper) And Usai (holder) is just too much fun to pass up. With all these positions the pressure is very much on, but you either thrive or dive when it comes to it, but that’s why we play sport to see if we can perform in the big moments. How do you think the step up in competition will be with the move to Div1? And what are your goals for the 2019 season? 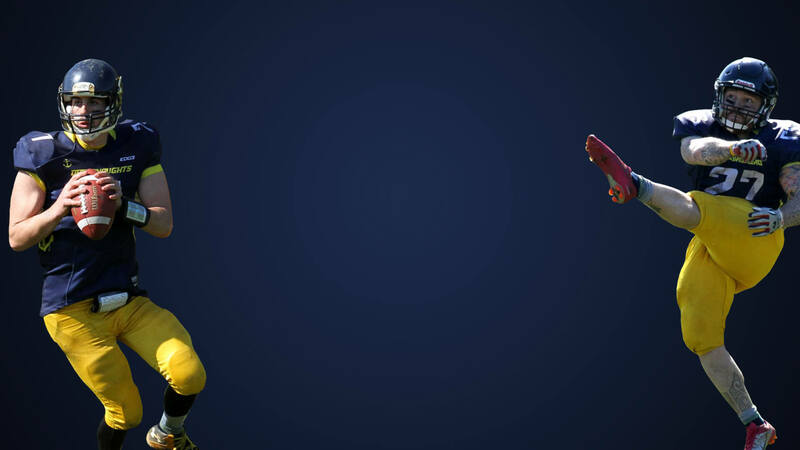 I think the step up will be fine, we have a good team and a good majority of the team have played together for the last couple years together. I think we will be massively overlooked as opponents in DIV 1 but that just makes it more fun when we perform well. It’s going to be tough but we have the right guys and coaches to perform. My goals this year are personally to get bigger because as we get better I need to be better as well. Would love to continue on one touchdown a year and really just perform in each game. I hate loosing but it’s always a bit better when you know you’ve performed as well as you can. Can you let the readers know a bit about you personally, background, what did you study and what are your aspirations? Me I went to university and studied Physical Education and Sports Coaching, before going to coach in a disability school. I left this to try and follow other career paths (not that I’m sure yet what they are). I have always been involved with coaching a sport my whole life. A Leicester fan due to my Dad being Leicester, and a jets fan due to poor life decisions. And if in doubt “GIVE IT TO QUADE”. Favourite NFL players and why? Favourite player at the moment would be Jamal Adams, Pure Swag. Weights, I’m not sure what cardio is. If you are were a DJ, what would your DJ name be? Thanks George great insight into the Linebacker and Special Teams positions there! 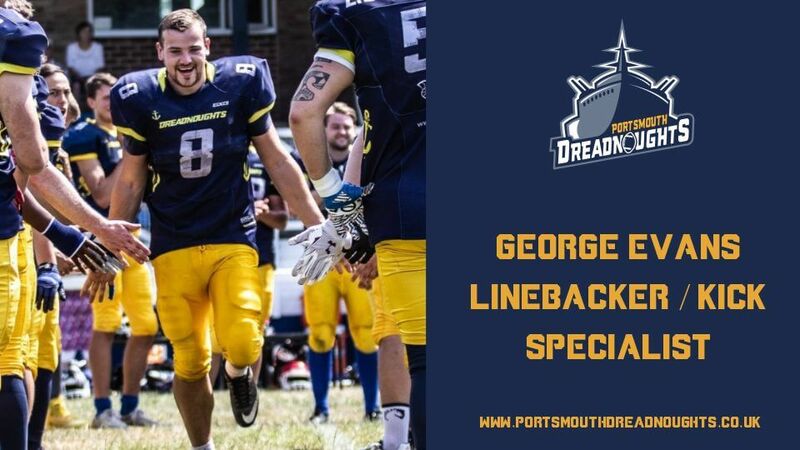 And to see if puners really are people too and watch George in action, head down to Test Park, Southampton to cheers on your Portsmouth Dreadnoughts as they face off against the South Coast power house Solent Thrashers!